George Lucas’ birthday is May 14, and I found him the perfect gift months in advance. As you can see, the Maxablaster isn’t your ordinary flashlight, and appears to be plucked right out of the Star Wars Universe. 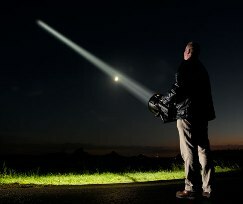 The Maxablaster is a homemade flashlight by Ducth engineer Ralf Ottow that produces 38-million candle power. You can use that to create a lightsaber so powerful that Jedi Master Yoda looks like a wimp. I can just see him: “Mmm, size matters not, no more will I say”. A light from the Maxablaster can illuminate a cloud four miles up in the sky, but I’m not certain why I would want to do that. This light is so bright that it can literally melt skin. That will definitely make the face-melting scene from Raiders of the Lost Ark a lot easier for the next Indiana Jones picture. Maybe this is why UV-filtering glass was added to filter these near-radioactive rays. Still, that might be good enough to roast Howard the Duck. Now all I need is a box to put it in. It had better not accidentally turn on, or it will burn the wrapping. I should definitely not install the batteries. By the way, I would need 54 batteries if George wants to use the Maxablaster out-of-the-box.